There is then much muttering under my breath and I start flipping through cookbooks and recipes for something, anything, different. Most recently, it resulted in a Dutch Baby. No, we didn’t adopt a small child from Holland. We took eggs, flour, spices, milk, and apples and transformed them into a thick, eggy pancake. The last time I made this, The Mistah remarked that his grandmother, or great-grandmother (I can’t recall which), used to make similar puffy, sweet apple pancakes. I had no such history with the Dutch Baby. But I can see that we definitely have a future together…at least when breakfast needs to be a little less routine. BAH Note: While I’m showing the recipe the way it appears in the South Beach cookbook, we got a little crazy and used 2 Honeycrisp apples, real butter, real sugar, and regular flour. I’m sure whichever way you make it will be delicious too. Melt 1 tablespoon of margarine in an oven-proof skillet (10 inches or larger) over medium heat. Add apple and cook until lightly browned, about 5 minutes. Puree remaining ingredients in a blender until just combined, about 1 minute. 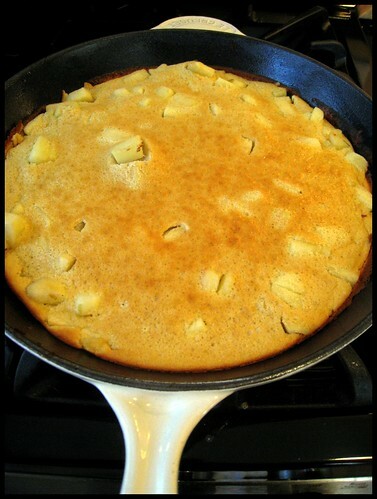 Pour batter into skillet, over apples. Bake until puffed and set, about 10 to 15 minutes depending on the size of your pan. My girls would love this! Filing this away for a nice, cozy morning. Biscuits and gravy is one of my favorite diner breakfast items. The Dutch Baby is a nice at home treat every now and then. Mmm…the smell of apples cooking in the morning. Oh so comforting. I think I must be anti-breakfast or something. Not that I don’t eat it (I do, every single day) I just don’t like to fuss with it. I will happily eat oatmeal 365 days in a row. Heck, I even pregame with oatmeal if I’m going out for brunch. Beth, does this ambivalence include bacon as well? Breakfast at our house is pretty boring but every once in a while I get an urge to liven things up. I typically eat bacon for dinner (!). Why should breakfast get all the love? Indeed. I like the way you think Beth. I am with you… the routine… getting out of it… especially at breakfast and in a hurry!!! I will have ty try this one. We also like to switch it up with breakfast parfais: layers of yogurt, granola and berries, topped with honey…mmm. Amelia, I’m branching out into breakfast smoothies in 2010. But Dutch Baby is a lovely indulgence on a weekend morning.